The weekend of 30-31st October was the staging of the National Full and Non Contact Titles in Sydney. 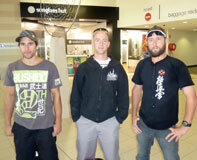 The Nerang Dojo took down 3 competitors who were in the Full contact event on the Sunday. On arrival, on the Saturday morning we hastened to The Sydney Aquatic Centre where the tournament was being held. Once there, all fighters weighed in with all within their weight divisions. 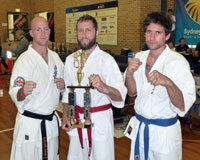 The fighters that journeyed to Sydney were Sempai Josh Cooke (Male open middleweight) Daniel Manukau (Male middleweight 5th kyu and under) and Andrew Fuchs (Male lightweight 5th kyu and under). Daniel was up first, but was unlucky to have been kicked on the jaw, which knocked him out. I think that he will have learnt a valuable lesson in keeping your hands up. Next was Sempai Josh who had a very cagey fighter, who was a counter fighter where he waited for Sempai to attack, and would only counter his attack. This seemed to frustrate Sempai and was not able to fight the fight he wanted to. In the end the frustration overcome Sempai and his opponent took the bout. Our last fighter was Andrew, who like the others had been preparing for this event for some months in advance. Andrew flew into the attack and gained the decision over all 4 of his opponents to take him to the finals of his division. During his last fight he sustained several foul techniques from his opponent to take out the title. A couple of the other dojo’s of the Branch also sent competitors to the event. All competitors doing their Instructors and the Branch proud. I know that in the future there will be more students to follow in their footsteps. I will be submitting their reports and photo’s to this website when they send them in, so keep watching this spot! A special surprise training session was arranged for Shihan Tony Bowden on Thursday 27th, May 2010, in celebration of his 60th birthday. 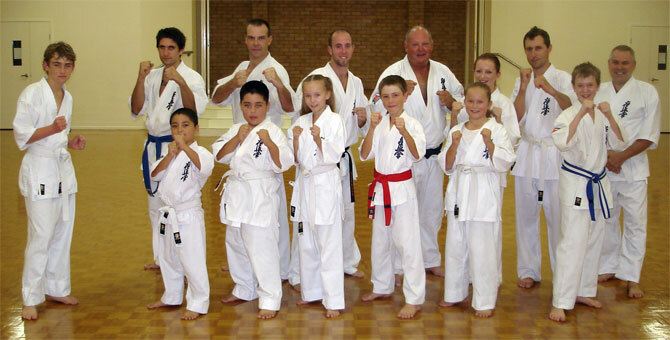 As Shihan was totally unaware of this pre-arranged training session, he was quickly overwhelmed by the attendance of many visiting instructors and students from Ipswich, Palm Beach and Kingscliff Dojo's. A brief speech of appreciation was made by Shihan before we charged into intense training session involving 60 repetitions of each technique, blocks, strikes and kicks. The atmosphere inside the dojo was absolutely electrifying from every student's effort and increasing energy in kiai. Following the kihon(basic technique's) we then moved onto some group kata for all grade levels. Shihan then took the advantage of the 'birthday rule' and challenged the higher grade students to perform kata with their eyes closed. This was a indeed a hard task for the students, but very humorous for Shihan and other onlooking instuctors. To close the training session for the evening, Shihan finished the class off with what the students expected to be another quick burst of 60 punches. Wrong! Instead he lifted the bar even higher, to push the whole class through a continous 5 minute blast of punches and strikes. Once again testing the student's kyokushin spirit. At the conclusion of the session, all students and instructors were treated to a feast of yummy pizza's, a well earned beverage, and of course a delicious chocolate birthday cake. This was truely a momentous occasion for Shihan and all other dojo's within the Queensland branch. A big thankyou goes out to Sensei Mike Wyvill, Sensei Phil Cox, Sempai Katie Cox and Sempai Josh Cooke for arranging the event. OSU!!! HAPPY 60th BIRTHDAY SHIHAN TONY OSU!! !